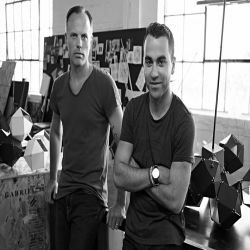 “With backgrounds in architecture, industrial design and jewelry-making, Gabriel Kakon and Scott Richler bring a multidisciplinary set of skill and style to the furniture & lighting world as GABRIEL SCOTT. Since their first collaboration in early 2004, the Canadian brothers-in-law has designed and manufactured exclusive pieces for the trade market throughout North America. In 2012, they launched GABRIEL SCOTT, a chic and contemporary line of furniture and lighting fixtures. Accessible to the retail and commercial market, the growing line continues to remain true to the designer's unique signature style and quality. All GABRIEL SCOTT pieces are handmade in their Montreal Studio and are stocked-to-ship from Upstate New York.